Tampa Bay fishing charters are keeping rods bent and anglers happy. The Tampa Bay trout bite has been and will continue to stay on fire as waters cool. Look for the bite to go strong through the remainder of the year. Most grass flats with good tidal flow in the Tampa Bay area will hold fish. I like to use 25lb fluorocarbon leader under a popping cork. Shrimp or scaled sardines are my baits of choice. The redfish bite has slowed down but we should see it pick back up any day now. The spanish mackerel bite is really heating up. This should continue through November if the weather stays warm. Fishing Tampa Bay ship channels and artificial reefs will produce good fish. 40lb fluorocarbon leader and a long shank hook are a must. Increase your odds with a chum block and a livewell full of sardines. Anchor boat up tide of structure and hang chum bag over to create a chum slick. Chum with live sardines, deploy baits and hang on. Mackerel can be tasty if you treat the meat properly. Make sure you have plenty of ice and get the fish on it ASAP. 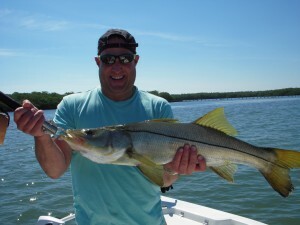 Snook season in the Tampa Bay area will be closed until September 2011. I haven’t been targeting them but have had some nice catches. We caught the snook pictured on a live scaled sardine will fishing for trout. This is a very encouraging sign for the snook fishery. We will be back to normal in no time.